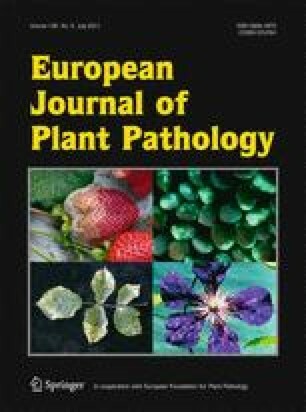 Decline induced by Chalara fraxinea is an emerging disease that severely affects ash stands in Europe. The disease appears to have an invasive spread from East to West of Europe in the last decade. The teleomorphic stage, Hymenoscyphus pseudoalbidus, that occurs as apothecia on ash rachis in the litter was recently described. The origin of ash decline remains unclear as a cryptic species, H. albidus, a long-established fungus in Europe, could be present in the same niche, and as in Switzerland, H. pseudoalbidus was shown to have been present long before the recent epidemic outbreak. In France, the emerging disease is very recent and clearly restrained to Northeastern France. We thus collected isolates from infected hosts and from apothecia/ash rachis both inside and outside the infected area in France in order to compare them on the basis of pathogenicity towards ash seedlings and sequences of the ITS regions and of three single-copy genes. We showed that two population types exhibiting about 2% base pair polymorphism in the sequences analysed were present in Northern France. The first type, corresponding to H. pseudoalbidus, was present on rachis and infected hosts only in Northeastern France and showed strong pathogenicity towards ash seedlings in inoculation tests. By contrast, the second type, which corresponds to H. albidus, was present throughout Northern France and showed no pathogenicity towards ash seedlings. Our study confirms the results of Queloz et al. (2010) who presented molecular evidences for the existence of two cryptic species, H. albidus and H. pseudoalbidus. The results strongly suggest that Chalara fraxinea/H. pseudoalbidus is a recent invader in France. We are grateful to Anne Derycke (DSF), Michel Hairaud, Rémy Péan and Jean Pierre Dechaume who indicated us sites with presence of H. albidus in Western and Central France. We would like to thank Jean-Philippe Rioult, from the Caen Herbarium (CN)-Université de Caen Basse-Normandie (UCBN) for the historical herbarium type specimens of H. albidus and Tadeusz Kowalski who provided isolates from Poland. This work greatly depended on the technical assistance of Jocelyn Gueny. We also thank Agathe Vialle (Canadian Forest Service, Quebec) for sharing a DNA extraction method for herbarium samples, and the Département de la Santé des Forêts for the maps of H. pseudoalbidus presence in France. This study was supported by grants from the Département de la Santé des Forêts and the Agence Nationale de la Recherche, contract number ANR 07-BDIV-003 (Emerfundis project).